Residents and staff of The Gardens Care Home enjoyed a sensory day last month (pictured above). Sensory days are very important as they help people suffering with Alzheimer’s and dementia. Residents with Alzheimer’s can find it difficult to communicate and perform everyday activities and by using everyday objects, we can trigger emotions, memories and heighten the 5 senses, allowing them to express themselves, feel safe and relaxed, with the end goal being to lift their mood, self-esteem and have a positive outlook. Above you can see one of our happy residents from The Gardens Care Home in Darlington enjoying her afternoon on Red Nose Day. A great day was had by everyone and residents of The Lawns in Monkseaton were also having fun when they were entertained and treated to a sing along with musician and singer Mick Young who visited the home. At Ascot Care our care assistants and nurses strive to help people in a caring, reliable and professional way, treating everyone as an individual and seeing that their specific needs are met in the best possible way. We received this lovely letter from one of our homecare residents who is delighted with the friendly and dedicated staff who visit him regularly to ensure he maintains the same standard of living as he always did. Our staff are thrilled to make such a difference in the lives of our residents, and were extremely happy to have received this card singing their praises. We would like to thank our staff for their continued excellent commitment to delivering the best care available. Well done! Residents of Springfield Lodge attended a coffee morning being held at St Mary’s Church in West Rainton on the 6th April. The residents had a wonderful morning chatting with friends, enjoying tea and cake whilst looking for bargains in the sale. Many residents bought books and other items which all helped in the donation to the Church where £175 was raised. The church wrote the above message on facebook to thank everyone and especially the residents of Springfield Lodge. The coffee mornings are open to everyone, friends and family, so come along, have a coffee, grab a bargain, whilst helping the church. 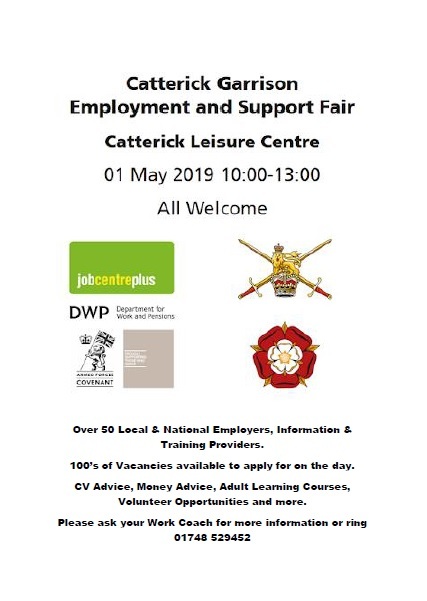 Ascot Care will be attending the Catterick Garrison Employment and Support Fair being held at the Catterick Leisure Centre on Wednesday 1st May between 10am and 1pm. Our friendly and experienced team will be ready to answer all your questions and guide you in the right direction. Whether you are completely new to the care industry or experienced and wanting a new challenge, or just wanting to upskill yourself through the training courses on offer, we are sure there will be something for you. We are looking forward to meeting you. Ascot Care are delighted to announce our latest appointment to the head office team. We are continually striving to improve all aspects of our service and the quality of care we deliver. With that in mind we welcome Angela Coates on board as our new compliance and standards manger. Angela is a former CQC inspector, local authority contracts officer and a registered nurse & matron, so is well placed to assist us in our pursuit of the highest levels of care possible. Angela will work closely with all our care mangers to maintain our rating of ‘Good’ across all 7 of our services and strive to improve all ratings up to “Outstanding”. Director Trevor Nesbit said "Particular mention should made at this time of the great efforts put in by Ian Proudfoot and Julie Charlton, Angela will add to the current team that have successfully guided us to the high standards we have already attained"
We welcome Angela and are sure she will fit into our established and experienced head office team. Come along to a fantastic Easter fair being held at Castleview Care Home in Alnwick on Thursday 18th April. Friends and family all welcome to enjoy the entertainment, puppet show and raffle! Also on Thursday 18th April between 2pm and 4pm there is an Easter Fair being held at The Lawns in Monkseaton. Everyone is welcome, so come along as there’s plenty to watch and take part in. There will be many activities including the Easter egg tombola, raffle, name the bunny, pin the tail on the bunny, guess the Easter cake weight and a cake stall with tea/coffee and scones on sale. There will also be rabbits, chicks and hopefully a miniature pony, so don’t miss out on all the fun, we’ll see you there! 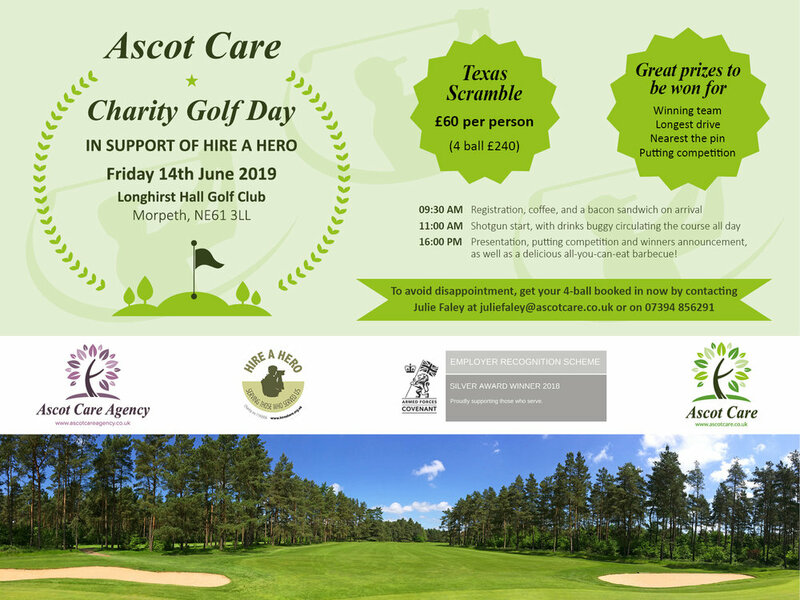 It’s that time again when Ascot Care are holding our annual charity golf day in support of Hire a Hero charity. This year we will be holding the fun event on Friday 14th June at Longhirst Hall Golf Club in Morpeth. This golfing event is held to raise funds for Hire A Hero which is an organisation which helps service leavers and veterans of our armed forces, along with their families, to successfully transition from life in the forces to civilian life, helping them gain employment and other aspects of day to day life they may require help with. So tell your friends and get a team together and secure your teams place before spaces are filled. The day will be great fun with a Texas Scramble format and shotgun start, competitions throughout the round, such as longest drive and nearest the pin, followed up by a putting competition and barbecue. This day tends to sell out quickly so book your place early to avoid disappointment, by contacting Julie on juliefaley@ascotcare.co.uk. You’ll have a great day at Longhirst Golf Club and be contributing to an outstanding charity.